Official artwork of Alph from Pikmin 3. Alph (アルフ, Alph) is the first of the three protagonists of Pikmin 3. He was the engineer on the S.S. Drake as well as the youngest crew member. After getting stranded on PNF-404, the world of Pikmin, it fell to him to reunite the crew, get the fruit they were sent to obtain and repair the ship's warp drive. The crew end up running into and saving Olimar in the end. In Pikmin 3, a group of three, consisting of Alph, Brittany and Charlie, are tasked with saving their home planet of Koppai as their food supplies become near depleted. When data collected reveals that a distant planet, given the name PNF-404 (which also happens to be the home planet of the Pikmin), is rich with a variety of fruits whose seeds can be cultivated on Koppai to end the food shortage, the crew of three travel to the alien planet in the S.S. Drake. However, their ship malfunctions and they become separated just before landing, with the cosmic-drive key also being lost, which is mandatory for leaving the planet. 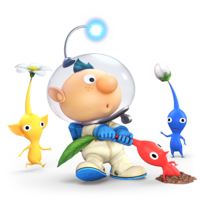 Over the course of the game, Alph reunites with Brittany and Charlie, collects fruit, harvesting their seeds and using their juice for sustenance while on the planet, and eventually meet up with Louie, and later on Olimar, who they rescue from the Plasm Wraith. As thanks, Olimar gives them their lost cosmic-drive key, allowing them to return to Koppai safely with their findings. Alph's render in Super Smash Bros. 4. 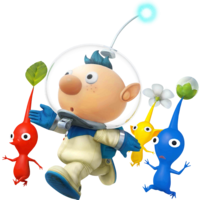 Four of Olimar's alternate costumes replace his model with Alph, making him an alternate form of a playable character. He has his own alternate palettes as well, having ones resembling his crewmates Brittany and Captain Charlie, and his third alternate palette resembling Olimar. Despite using a different spaceship, the S.S. Drake, in Pikmin 3, Alph still uses Olimar's Hocotate Ship for his on-screen appearance and Final Smash. He has a trophy using his playable model, classified under the fighters category. However, it is obtained in the Trophy Shop instead of as a reward for clearing Classic Mode, similarly to the Koopalings. According to design documents for the game available in Masahiro Sakurai's book "Thinking of the Making of Video Games 2" (桜井政博のゲームを作って思うこと2), Alph was planned to be included as a clone alongside Lucina, Dr. Mario, and Dark Pit, instead of just being an alternate costume for Olimar. Rock Pikmin were additionally planned to be included, where they would be heavy and short-ranged, but very powerful, similarly to Purple Pikmin. However, neither idea ended up implemented in the final release, presumably because of time constraints. Alph's Trophy in for Wii U.
Alph's Trophy in for 3DS. Alph is a young explorer who crashed on the planet PNF-404. As the engineer of the S.S. Drake, he feels responsible for finding the missing crew and the ship after the crash. Waking up in a pond, Alph quickly encounters a tiny creature— it's a Pikmin! Alph's render in Super Smash Bros. Ultimate. Alph returns in Super Smash Bros. Ultimate, reprising his role from Super Smash Bros. 4 as a playable character that can be accessed via Olimar's alternate costumes. Due to Olimar being an unlockable character in Ultimate, Alph (by extension) is also considered to be an "unlockable" character and will be automatically available for use once the former has been unlocked. Alph and Olimar on Garden of Hope in Super Smash Bros. for Wii U.
Alph and Olimar on Wuhu Island in Ultimate. Alph is the only playable character in Super Smash Bros. 4 and one of two playable characters in Super Smash Bros. Ultimate (the other being Inkling) whose console of origin was the Wii U.
Alph is the first alternate character to become playable in Super Smash Bros. after his base fighter, the other one being the female Pokémon Trainer. This page was last edited on March 22, 2019, at 01:18.